Vijay Goel along with party workers marched with placards reading “Central Government is giving relief but Kejriwal government is looting”. 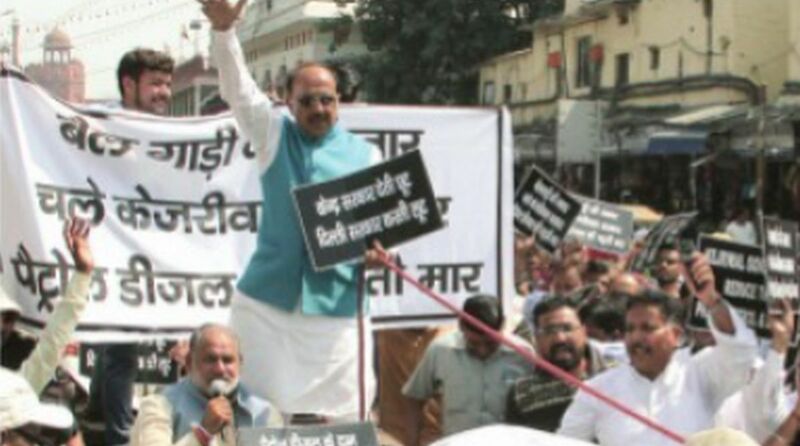 Union Minister of State for Parliamentary Affairs and ex-president of Delhi BJP Vijay Goel on Sunday took out a bullock cart protest march from Red Fort to Sadar Bazar against the Kejriwal government on the issue of rising prices of petrol and diesel. He along with party workers marched with placards reading “Central Government is giving relief but Kejriwal government is looting”. Vijay Goel said if the prices of petrol and diesel were not reduced in Delhi, then the BJP’s bullock cart march would go to Kejriwal’s residence. “The prices of crude oil are on the rise in international market. Though the Central Government does not get as much revenue as the state government from taxes on fuel, still the Centre reduced price to the tune of Rs 2.50 per litre. However, the Kejriwal government failed to reduce the price of petrol and diesel. The situation has arisen that residents of Delhi are compelled to get petrol and diesel from nearby states,” said Goel. He said it was expected from the state government to reduce the tax burden of 42 per cent on petrol and diesel and further provide relief to citizens on account of rising fuel prices. However, Kejriwal just believed in accusing the Centre and misleading the general public. “Kejriwal came to power in Delhi as a messiah. However, his reality has now exposed to public. Residents of Delhi have still not forgotten his false promises of providing free electricity and water. His four years of administration has turned Delhi into a dumpyard. It is because of his failed policies that everyday now and then, the safai karamcharis are on a perpetual strike,” Goel said during his protest march. Developmental works in Delhi have stopped altogether. Instead of working for the people of Delhi, he is always found making statements on TV, Facebook and Twitter. “The Kejriwal government is running on bullock cart speed. The Delhi government is not competent to take decision and is only wants to be in a tussle mode with the Centre. 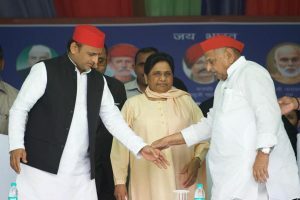 If he wants to debate only, then he should do it with public, at least he will get to know how the general public feels about his policies and administration in Delhi,” Goel added.